Ahead of the Malta Innovation Summit I had the pleasure of being interviewed by The Times of Malta on my journey into innovation, why Innovation doesn’t happen overnight or at random and how can an organisation embed innovation into its culture? There is risk in the pursuit of innovation. But the big question is whether it’s riskier to not pursue it, says Cris Beswick. You originally trained as a product and industrial designer and spent a decade as a successful entrepreneur and CEO of a design group. What led you to exit this sector and enter the field of innovation consultancy? I was incredibly lucky to start my career as an industrial designer as the core thinking, frameworks and approaches we use as designers have come full circle and are now a core part of how corporates are tackling the innovation challenge. I spent a decade in that industry, most of that time running a group of consultancies which was an amazing time and I was fortunate enough to have some incredibly talented people work for and with me. But I got to a point where I wanted to do something different and more challenging. I didn’t know what that was going to be at the time, so I actually sold my companies not knowing what I would do next. I actually sold the whole group six days before Lehman Brothers crashed in September 2008, so I was incredibly lucky from a timing point of view. It was that crash that became the catalyst for what I do now. While still running my companies I had built up connections around the world with CEOs and senior leaders and it was in response to the post-Lehman Brothers shifting environment that some of them came looking for support. The word innovation started to be cited as the panacea to the new environment that many organisations found themselves in, but the subject was hugely misunderstood, some would argue still is. So I began speaking on subjects like strategic design, innovation and how leaders could build a culture of innovation and it snowballed from there. A decade on I now work globally with some of the world’s most ambitious CEOs and leaders, people who genuinely want to shape the future. Innovation – like ‘exclusive’, ‘new and improved’ and ‘disruptive’– frequently borders on the rhetoric. What is real innovation? I agree and would even go as far as to say that most of the time the language doesn’t just border on the rhetoric, but it’s full blown rhetoric. Many will have heard the term ‘innovation theatre’ and it’s a shame that there’s still so much of it about because we no longer operate in a world where organisations can survive without being creative, adaptable, design-led and purpose-driven. When it comes to innovation, the subject of language is really important. One of the core things we have to do is define exactly what innovation is to our organisations so that we can have congruent and aligned conversations about it. I think it’s important to shift innovation from being a thing and consider it more of an outcome and something that our customers decide not that we self-profess as organisations. In what ways does innovation give an organisation the competitive edge? I think innovation doesn’t give organisations a competitive advantage – innovation is the competitive advantage. If you consider innovation as an outcome, then your focus shifts to the elements that will collectively deliver that outcome. When you do that as an organisation you widen your perspective on what’s important – that is, it’s not just about the product but about the collective endeavours of the whole organisation and its macro pursuit of purpose, excellence, creativity and genuinely solving systemic problems. If you look at methodologies like value proposition design for example, the language used focuses on ‘pain relieving’ and ‘gain creating’ or outcome-driven innovation or jobs-to-be-done as it’s better known focuses on ‘empathy’ and it’s in the use of this language and the pursuit of these things that organisations become innovation vanguards. Innovation doesn’t happen overnight or at random. How can an organisation embed innovation into its culture? One of the words I’ve just mentioned is ‘purpose’ and it’s one of those words that’s disproportionately important when we’re pursuing innovation. If we start with purpose and why an organisation exists, what it really wants to achieve, and we make innovation the outcome that will deliver that purpose, we start to build a fundamentally different organisational culture. What we also start to do is engage people in a different way, as well as start to engage different people. One of the biggest challenges on the horizon for organisations is the war on talent, especially around generation Z. The irony is that everything I’ve talked about here is what Gen Z want in an organisation. They want purpose, they want to solve genuine problems and they want the creative freedom and adaptability to be able to do it as intrapreneurs. If they don’t get it, they’ll build their own start-ups and become the entrepreneurial unicorns to the proverbial corporate dinosaurs. There is risk in the pursuit of innovation, but the big question is whether it’s riskier, in the VUCA (volatility, uncertainty, complexity and ambiguity) world we operate in, to not pursue it. When you get into the practical side of things the methodologies, frameworks and tools that underpin innovation are all designed to help mitigate risk, think lean and built-test-learn for example. When you build the right strategy, governance and approach for innovation and scaling capability across an organisation, managing the risk component isn’t difficult. You will be speaking at the Malta Innovation Summit – what will you be focusing on? 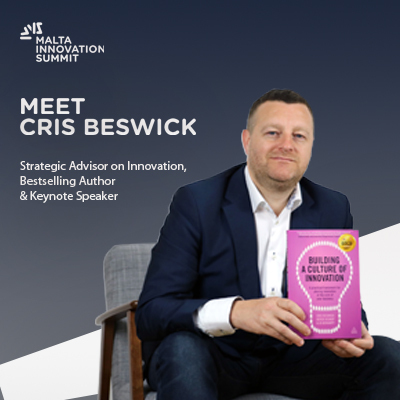 I’m really looking forward to speaking at the Malta Innovation Summit. I’ll be talking about much of what I’ve mentioned here and the importance of getting the right strategy, leadership and culture to work together as a coordinated effort. In fact, as a contemporary response to Peter Drucker’s famous quote “Culture eats strategy for breakfast”, I’ll be talking about why I think “Strategy, leadership and culture should eat breakfast together” if we really want to build organisations capable of shaping the future.